Among the most well-supports teams in Major League Soccer, Portland Timbers today revealed their home kit for their 2019 league and US Open Cup seasons. 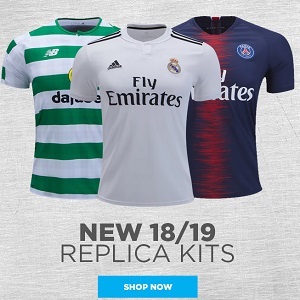 It will be on sale at World Soccer Shop, Kitbag, Pro:Direct Soccer and UK Soccer Shop along with the former MLS Champions’ 2018/19 away jersey. The Portland Timbers Green and Gold colorway is highlighted in their new primary 2019-20 kit from adidas, featuring Ponderosa Green and Green Night hoops with Ponderosa Green sleeves and Native Gold and white trims and details. The new kit offers a modern interpretation of a traditional hoop graphic with alternating green horizontal stripes across the front. Along with the Timbers crest on the front, jersey sponsor Alaska Airlines, in gold, runs along the chest. A Stand Together crossed-axe logo appears on the back top and a line from the iconic Timbers Army “Party in Portland” chant “We’ll Sing For You Timbers – ‘Til You Finish The Fight” is featured on the inside neck tape. The Portland Timbers 2019 home shirt introduces a newv-neck design from MLS tehcnical partner adidas that we expect to see more of during the 2019/20 club and international football kit cycle.